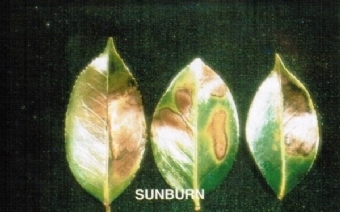 Sunburn or sunscald appears as yellowish or bronzed areas on the upper side of the leaves with severely affected areas turning brown. These brown areas nearly always are interveinal and appear in the center of the leaves as opposed to salt injury which appears at the leaf margins. It is especially seen on plants with virus variegation in the foliage or when plants are moved from shade to sunshine. Some varieties are more susceptible than others.